Are you looking for adventure and privacy and have you always wanted to sleep in a tower? In that case, we can highly recommend Torre Maremma. 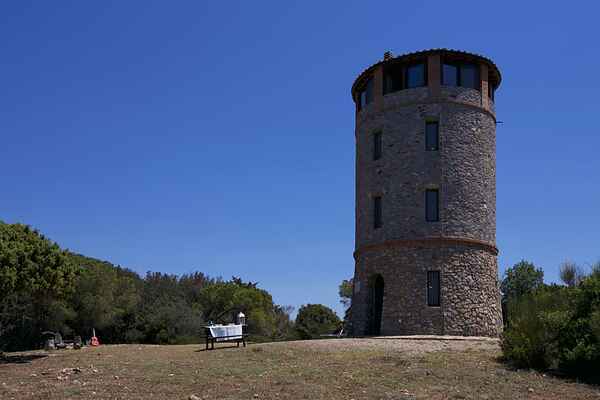 Torre Maremma is an old watchtower that is situated in a 500 acre nature reserve; the Parco Naturale della Maremma. This impressive watchtower (80 m²) is cylindrical in form. The tower has been entirely renovated and tastefully decorated, and is divided into three floors. On the third floor there's a panoramic hall with windows that offer a 360° view. It is the perfect place for nature lovers who want to enjoy it to the full. You have a beautiful view of the Tuscan Archipel; the largest protected underwater area in Europe. It consists of reefs and large and small islands such as Elba, Giglio, Capraia and Montecristo. Getting to the watchtower is an adventure in and of itself. You have to drive the last 8 km over a hard, bumpy road passing olive groves and fields of hay, leading you up to the the woods of the Monti dell' Uccellina. There's a beautiful beach 2 km away that you can use together with the temporary residents of a fattoria (a few km down the road).